JayeL Audio | Cut Copy: Summertime "Colours"
Home » Electropop » Cut Copy: Summertime "Colours"
Those good reasons and the fact that my current file-sharing site, File Den, decided to ban me from use (if anyone has any better ones, let me know), should explain my absence. At least I didn’t “leave you without a dope beat to step to” (see Nark Inc.). By now, Lil’ Wayne sold a “Millie”, Lollapalooza released its 2008 schedule, and Girl Talk took the Radiohead route with Feed the Animals(more on that later). You also might have noticed Cut Copy‘s rise to fame. From February to May, their tracks (and remixed tracks) have ruled the Hype Machine’s top 50 and have quickly risen to my iPod’s top 100. There isn’t much more I can say about these Australia natives, other than that they know how to make catchy, yet thoughtful (“So Haunted”) dance hits. 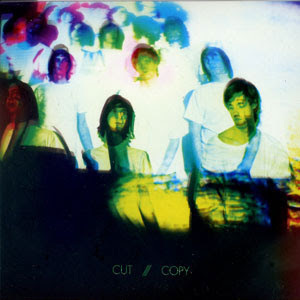 In what could be confused for a number of styles, Cut Copy manages to create an electropop sound with guitar, drums and keys. At times In Ghost Colours sounds like an 80’s throwback (“Lights and Music”) without the cheesy haircuts and outfits, and at others its simply, good indie rock (“Midnight Runner” & “Unforgettable Season”). In Ghost Colours could possibly be the album of the summer with breezy songs like “Feel the Love” and “Hearts on Fire”. Cut Copy is currently touring the U.S. and making stops at Pitchfork and Monolith. Everything I have heard about their live show sounds amazing and makes me jealous I missed their Magic Stick show.